Thank for your question. I don't know of a specific "template" for an adjacency matrix in Powerpoint, as it is really meant as a software for outlines for presentations, and not specific to interior design or "graphing", but I do have some ideas for you. If you set this up in Excel, you'd have all of the squares below the darkened/filled in squares in the image, but you could just leave them blank or crop them out if needed to get your matrix to look just like this. Another way you could use Powerpoint's tools would be to use the TABLE feature, but this would give you just a rectangular table with rows and columns. You would then need to add text boxes across the top and the side to create the remaining elements. Both of these Powerpoint tools are under the INSERT tab, then select TABLES. 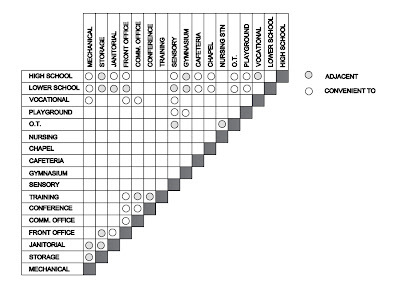 For a diagonal style Folded Adjacency Matrix like this one below, you could also create it using AutoCAD and then copy and paste it into your Powerpoint Presentation. That would be another method as well!